1984 brought the Friends Journal ’s second special issue on war taxes, at a time when even its critics acknowledged war tax resistance as a mainstream practice in the Society of Friends. [T]he World Peace Tax Fund Bill…[’]s enactment won’t lessen defense spending; Congress will still need to do that. What it will do is establish a Peace Trust Fund (like the eminently successful highway trust fund), enabling our society to make a striking (i.e., dollar-worthy) commitment to seeking peace (via, for example, funding a peace academy, U.N. peacekeeping forces, the use of mediation, negotiation, and reconciliation techniques — none of which are currently part of U.S. commitments). As to alternative service for war tax dollars being but an “accounting illusion” or only easing the consciences of pacifists, the same applies to the now-established alternative service of C.O.s. Although men choose alternative service, our government has never lacked the bodies to pursue any conflict any place, any time; but the C.O.’s personal witness still stands for what it is, a man’s conscientious decision not to be a part of the war system. If we could have C.O. status for men over 20 and all women, allowing them not to pay for war but to have their tax dollars go toward peacemaking, our society would make a new and totally different kind of statement to this violence-weary world. There’s a little bit of sleight-of-hand here in comparing people who would pay their taxes into a government-run alternative fund with only those conscientious objectors who would be willing to enter government-run “alternative service” in lieu of combat roles (as opposed to the many conscientious objectors who refused to be conscripted into any service whatsoever). But it’s also important to note that these earlier versions of the “peace tax” scheme were much more conscientious about segregating the “peace tax” payments so that they would pay for new, additional, nonviolent, peace-seeking measures. This enabled promoters to make a much stronger case in favor of the bill than today’s poor “Religious Freedom Peace Tax Fund” promoters — who have to somehow defend the idea that “peace tax” payers’ dollars will somehow magically get routed just toward the non-military portions of the government’s usual budget. 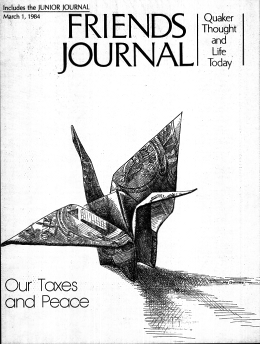 The 1 March 1984 issue of Friends Journal was dedicated to “Our Taxes and Peace” — the second such issue devoted to the war tax issue that I found in the archives. [W]hat can we do, many of us are asking, to stop the flow of our tax money to the Pentagon? It feels as if the Society of Friends has come more under the weight of this concern in the past year. My yearly meeting (Philadelphia) wrestled with the question of tax resistance a year ago, and monthly meetings have been asked to consider the question further as they prepare for yearly meeting sessions this month. Within my own monthly meeting I have attended clearness meetings this year for members seeking direction and support on the issue. And I have seen a marked increase in the number of members taking tentative steps to withhold at least a portion of their taxes. Reports from abroad include London Yearly Meeting’s minute of support this past summer for its employees who seek to hold back the military portion of their taxes. [W]e are led to declare for ourselves that all participation in war and preparation for war — in any form — is contrary to the Spirit and teachings of Christ. By this, we mean that membership in the armed forces of the United States or of any country, whether under arms or as a noncombatant; participation in, including registration under, a system of military conscription; acceptance of the privilege of alternative service as a conscientious objector; payment through taxes, both direct and indirect, for wars past, present, and future; and all other forms of participation in the war system, which now holds the world in such deep oppression, are in direct opposition to the Peace Testimony of the Religious Society of Friends. Friends are advised to examine themselves, their finances, their possessions, and all of their associations to discover whether they are clear of such participation in war and preparation for war, and if they are not, to seek guidance and support from their monthly meetings in their efforts to attain clearness. We accept that this search for clearness will inevitably bring us, both individually and corporately, into conflict with the laws of the United States and of other countries, and we pledge our full moral, spiritual, and financial support to any Friend or meeting in need of such support as a result of this minute. We realize that there are many Friends who will not be in full unity with this minute at present, who will feel it is their duty as U.S. citizens to continue paying the taxes demanded of them by the federal government, and to support and counsel cooperation with military conscription. We recognize the depth of their convictions but stand in loving disagreement with them, and we pledge them, too, our full moral, spiritual, and financial support as they struggle to reach clearness on this concern laid upon us by the Lord. We are indeed loyal citizens of the United States, but first we are citizens of the Kingdom of God, and the higher law must always take precedence over the lower. Most of the current discussion of “war” taxes within the Society of Friends is based on the implicit assumption that those who don’t pay them are morally superior to those who do. The charge of the 1983 Philadelphia Yearly Meeting to that of 1984 is to come up with a “stronger minute” on war tax concerns than the one currently on the books, clearly implying that greater “strength” in this area must be morally superior. In a discussion several months ago at Representative Meeting in Philadelphia, those who obey the law were compared to the Quaker slaveholders of the 18th century , and not a dissenting voice was raised. It is important to him to be a vigorous participant in the various “circles of community” that he finds himself in, and only to be a disruptive force in those circles in the most extreme circumstances, when productive participation is no longer possible. He feels that the national circle in the United States has not reached such a stage, and so it’s better to play by the rules. The national security establishment is just a large-scale version of such thoroughly moral defenses as “police forces and locks on houses” — they are not evil in and of themselves, though they can be used in evil ways or can become aggrandized in an evil way. But war tax resistance treats them as pure evil. He then described the varieties of resister: the one who reduces his or her income below the tax line (the “most admirable” variety, according to Swayne), the one who tries “limiting but not eliminating federal income tax liability, and paying the required tax” (Swayne considers himself one of these, saying he “does so from prudential rather than pacifist motives” because “I think I give money away more wisely than does Uncle Sam”), and the one who refuses a symbolic “military” percentage of the federal income tax (this, he calls the “mainstream” variety). It actually means the government gets more money in the end. The calculation of the “military” percentage is flawed. By filing legal cases contesting government actions against resisters, these resisters undermine their moral position, becoming not civilly disobedient martyrs but mere plaintiffs. Such war tax resisters incorrectly deny that their position sets a precedent for tax resisters of all sorts. Law-breaking reflects poorly on the peace movement in the court of public opinion. As for the tax refusers, I hope other Quaker taxpayers will join me in accepting their position, despite its ambiguities, as being in the mainstream of Quaker thought, and therefore entitled to support from Quaker bodies. I will support them not out of a sense that theirs is the morally superior position, but only because they are taking a greater risk. Following that, Franklin Zahn promoted phone tax resistance as “a simple way of continuing Friends’ tradition of witnessing for peace.” He first wrote about why resistance was important (indeed, he felt, as a regressive tax at a time of reduced social welfare spending and tax cuts for the rich, resisting this particular tax could be justified even without reference to military spending), and then explained the mechanics of how to resist and how the phone company is likely to respond. No one has ever been jailed for refusing the telephone war tax. Although the tax is small, its refusal by thousands of Friends could be a significant force for peace. Gandhi, for instance, made good use of a very small salt tax. Being “effective,” however, need not be the main motive in refusals. A draft-aged person refuses induction not primarily to be effective but because it is immoral to support war. The same motivation can apply for tax refusers. There was also a brief note in that issue about a new “study document” from the National Council of the Churches of Christ on “The Churches and War Tax Resistance,” but it didn’t give much indication about the content or the context in which it had been produced. The 15 March issue brought the news that a group of “peace tax fund” promoters in Canada had incorporated and were planning to pursue a test case in the courts that they hoped would establish a right to conscientious objection to military taxation under the new Canadian Constitution. Kingdon Swayne’s challenge to what he identified as the orthodox Quaker position in favor of war tax resistance drew some responses that were printed in the 15 May issue. Roland Smith, “a rather recent tax refuser,” thought Swayne’s criticism was “helpful” but not always correct. In particular, he didn’t think that it was true that war tax resistance always would mean the government would come out ahead in the end, and he felt that the difficult (Swayne called it “arbitrary”) practice of trying to discern the military portion of your tax bill represented “not a drawback but… an opportunity for the refuser to exercise his or her conscience in deciding which percentage of which budget figure to use.” More troubling, he thought, was the threat to democracy embodied in the idea that people could conscientiously choose to support some decisions of their elected representatives and not others. My personal experience suggests that we feel most anxious when we are in a stage of determined avoidance, when, intuitively, we sense something stirring within us for which we believe we are not ready. All of our defenses are mobilized and we shut ourselves off from that inner stirring — but at a price! Last year the Internal Revenue Service began using a special $500 penalty against people who make protest claims on income tax returns. This “frivolous tax return” penalty is a significant and intolerable assault on the inalienable rights of freedom of speech and religion. It seems to me both a challenge and an opportunity for mass civil disobedience by people of conscience. The only act needed is to assert the rights of conscience on an income tax form. As an experiment in showing the way, I have begun to file daily protest returns for each day of 1983 . My net income from my work as a carpenter in 1983 will be reported and distributed on 365 tax returns, at an average of about $38 per day. Each return will be addressed to a different employee or office of IRS. A copy of the daily return will be sent each day to a different newspaper, magazine, public officeholder, or peace organization. If the IRS imposes penalties for all of my returns, the total assessment may rise to more than $180,000. I have already received notice of one penalty for $500. Of course I don’t intend to pay or allow collection. I invite Friends to join with me in resisting war taxes and this penalty on the expression of conscience. This is a good project for people like me, who feel able to protect their income and assets from seizure by IRS. Some others, whose assets are more vulnerable to collection, may participate by filing protest statements on tax return forms, in the names of some of the victims of U.S. militarism worldwide. 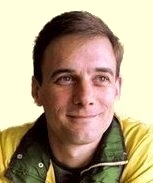 The minute which finally resulted said, in part, that “Friends are uneasy in conscience that a substantial portion of their tax dollars goes for military purposes”; that we “are ready to support a wide variety of approaches to war tax witness in accord with individual circumstances and leadings”; that “while Friends do not urge one another to undertake civil disobedience, Friends are ready to give strong support to members led to refuse payment of taxes for military purposes”; and that “most Friends strongly endorse passage of the World Peace Tax Fund legislation.” The minute concluded, “We realize that we have no single or simple answer to the dilemma of praying for peace and paying for war. We ask for Divine Guidance as we proceed in struggling with the issue of taxes levied for war-related purposes.” The issue will be considered again at the 1985 sessions. In the 1 June issue was a letter from Donna and Jerome Gorman in which they explained how they had extended tax resistance-like techniques to a State-level battle against capital punishment. They held back a symbolic 1¢ from their electric bill to protest against the Virginia Electric and Power Company’s complicity with the state’s electrocution method of executing prisoners, and later began to also withhold 1¢ from their phone bills in a similar protest because of a state excise tax on phone service. They saw this largely as a method of getting the attention of people to whom they could then direct anti-death-penalty outreach. We refer to this economic and tax resistance as “penny resistance.” Multiple innovations in economic and tax and other forms of resistance are most urgently needed to impede the various methods of carrying out capital punishment. We pray and we hope that many others will consider joining in this resistance. The Tax Resisters’ Penalty Fund is a sort of “mutual aid fund” for war tax resisters. Formed in 1982 , the Penalty Fund is supported by people who contribute small amounts of money periodically to help war tax resisters pay fines and interest levied by the IRS. Funds contributed are used to help pay not the resister’s original tax burden but what the IRS terms “statutory additions”: interest, penalties, and fines imposed because of war tax resistance. When each supporter contributes his or her small amount, the total becomes enough to reimburse the resister for the additional cost of his or her witness. For example, 200 supporters contributing $2.50 each could cover the aforementioned $500 “frivolous” penalty. The Tax Resisters’ Penalty Fund has grown from 85 supporters in 1982 to 400 supporters today . The larger we grow, the bigger an impact we can make and the smaller each supporter’s contribution will need to be. Finally, in the 15 December issue, Dan Merritt reminded people that phone tax resistance was still a good option, and noted that the Claremont, California, Friends Meeting had been refusing to pay the phone tax since the Vietnam War. What to do about the payroll tax… I suppose I could just stop paying it. But maybe it’s what happens next that makes a difference.